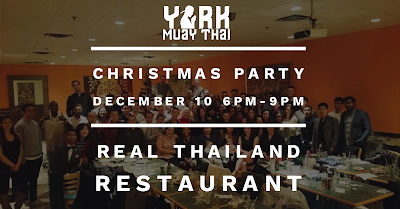 York Muay Thai- Toronto: YMT Christmas Party on Dec 10! RSVP on Facebook or with Kru Jen! 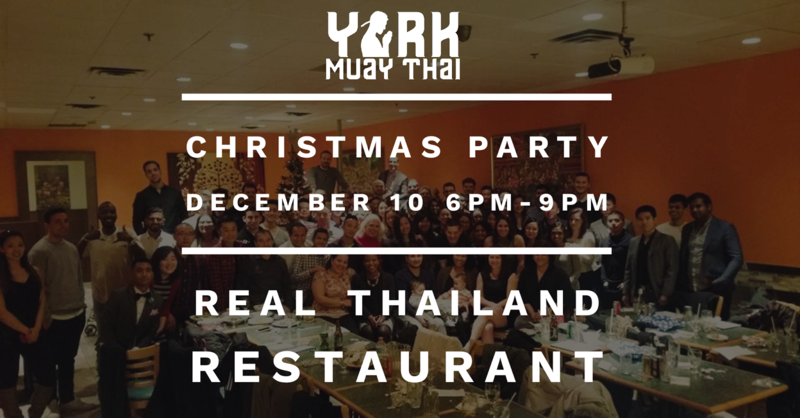 YMT Christmas Party on Dec 10! RSVP on Facebook or with Kru Jen! Our Annual Holiday Party is upon us! Don't miss authentic Thai food served during our presentation. This event is always a wonderful event celebrating the year and taking time out to socialize and appreciate one another. FRIENDS/FAMILY/KIDS ARE ALL WELCOME BUT PLEASE INDICATE THE # OF GUESTS ON THE WALL OF EVENT or SPEAK TO KRU JEN. $40 cash by Dec 6th!! Fresh Rolls, Fried Rolls, Mango salad. We give away lots of gear and fun stuff! If your number gets chosen you get to choose a door from the Holiday Tree and win a prize! WOOOT! This year was HUGE for us on the competitive seen as we had such a strong fight team and so many great results. Check out our Annual Highlight Reel made by Poo Choi Patrick and Kru Cam! 2-0 for the YMTeam! Good job Vincent and Rafa! 4 Gold and 1 Bronze at Nationals for the YMTeam! !